Outside the Box: Puppy Day! So last week we had National Puppy Day! Festive Friday over at the Outlawz likes to celebrate the unusual days! I made this card using an Aurora Wings stamp that is sooo cute it could only be used for a lovely celebration of cute puppies! 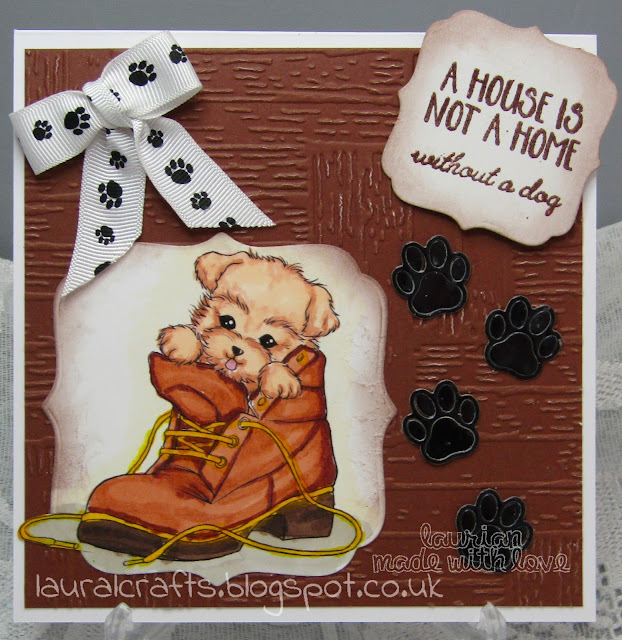 I used the parquet embossing folders from Crafters Companion for the background, the paw print die cuts are from Joanna Sheen's range. The sentiment was stamped with a freebie stamp on a craft mag then embossed with chocolate embossing powder then inked around the edges, finished with a little bow of paw prints. I coloured the image with Copics. Thanks for popping by and don't forget to check out all the fun themes at Festive Friday! Thank you Donna for your lovely comment! Thank you Mitzi for the beautiful image and I hope I have done it justice! Oh I love this sweet puppy Laurian! It's so CUTE! Love the color you've chosen for it too. Hugs.